The family moved to New York and then to San Francisco where he grew up. He studied at Oakland College and then in Hanover, Germany, where he studied chemistry and mechanical engineering in the Polytechnic College until 1872. He returned to California and began working for his father, who had grown extremely wealthy in the sugar business. In 1876 he went to the Hawaiian Islands, where he worked in his father’s sugar business. Sons of the Hawai‘i “Sugar King” (Claus Spreckels) formed John D Spreckels and Brothers (John, Adolph and Claus Spreckels.) On December 22, 1881, the Oceanic Steamship Company was incorporated in California. It was the first line to offer regular service between Honolulu and San Francisco, and it reduced travel time immensely. While the sailing ship “Claus Spreckels,” made the trip in less than ten days in 1879, the new steam vessel Mariposa required fewer than six days to make the run in 1883. John became very wealthy in his own right. In October, 1887, he married Lillie Siebein in Hoboken, New Jersey, and together they had four children. They first lived in Hawaii and then in San Francisco. Impressed by the real estate boom then taking place, Spreckels invested in construction of a wharf and coal bunkers at the foot of Broadway (then called D Street). That boom ended soon but Spreckels’ interest in San Diego would last for the rest of his life. He established Tent City, a large vacation campground that sprung up near Hotel del Coronado. Tent City grew quickly — from 300 tents in the first year to more than 1,000 three years later, and attracted visitors from across the nation as an affordable vacation alternative. In 1892, Spreckels bought a failed streetcar operation and launched the San Diego Electric Railway Company. 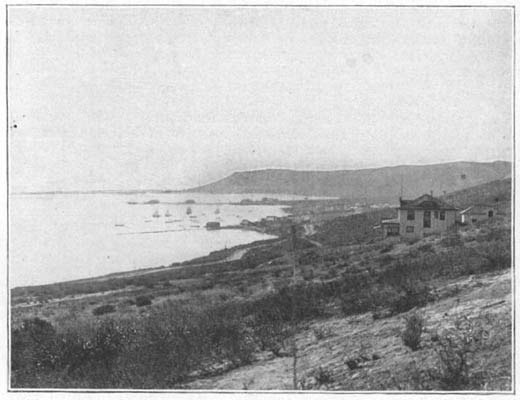 Spreckels’ business played a key role in San Diego’s growth, providing access to areas such as Mission Hills, North Park, Kensington and East San Diego that were largely undeveloped at the time. For a time, Spreckels was owner of the San Francisco Call, then a morning newspaper. While still living in San Francisco he continued his investment in San Diego, buying the San Diego Union newspaper in 1890 and the Tribune in 1901. He moved his family permanently to San Diego immediately after the 1906 earthquake and moved into his new mansion on Glorietta Blvd. in Coronado in 1908. That structure survives today as the Glorietta Bay Inn. In the next decades Spreckels became a millionaire many times over, and the wealthiest man in San Diego. At various times he owned all of North Island, the San Diego-Coronado Ferry System, Union-Tribune Publishing Co., San Diego Electric Railway, San Diego & Arizona Railway, Belmont Park in Mission Beach. He built several downtown buildings, including the Union Building in 1908, the Spreckels Theatre and office building, which opened in 1913, the San Diego Hotel and the Golden West Hotel. He employed thousands of people and at one time he paid 10% of all the property taxes in San Diego County. “Transportation determines the flow of population,” said Spreckels, and throughout his ownership of the streetcar system he extended it from downtown to new areas where he owned land, such as Mission Beach, Pacific Beach and Normal Heights. He invested millions in the San Diego & Arizona Railroad, the “Impossible Railroad”, which finally opened a rail link to the east in 1919, after 13 years under construction. Spreckels organized the Southern California Mountain Water Company, which built the Morena and the Upper and Lower Otay dams, the Dulzura conduit and the necessary pipeline to the city. Spreckels contributed to the cultural life of the city by building the Spreckels Theatre, the first modern commercial playhouse west of the Mississippi. He gave generously to the fund to build the 1915 Panama-California Exposition and, together with his brother Adolph B. Spreckels, donated the Spreckels Outdoor Organ Pavilion in Balboa Park to the people of San Diego just before the opening of the Exposition.